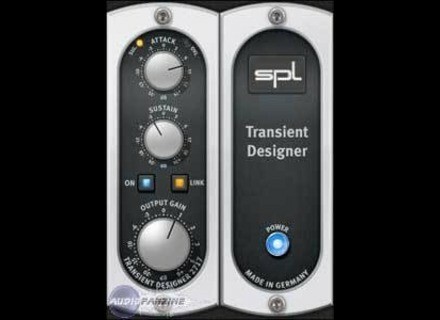 SPL Transient Designer, Software transient shaper from Universal Audio in the UAD Plug-In series. loudfunk's review"So simple, so effective. Don't know how I ever lived without it..."
Easy as pie, download the authorization after purchase and it's unlocked on your UAD card. Universal Audio has partnered with German company Sound Performance Lab (SPL) to bring you the Transient Designer, with its unique and compelling Differential Envelope Technology for shaping the dynamic response of a sound. Only two simple audio controls are required to allow you to effortlessly reshape the attack and sustain characteristics. SPL was the first company to design an analog solution for level-independent shaping of envelopes, allowing transients to be accelerated or slowed down and sustain prolonged or shortened. You can shorten or lengthen the attack and sustain of percussive signals such as kick drum, snare or toms, easily take the bleed from open mics, or expand the room sound of overheads. The Transient Designer’s magic can be applied to virtually any other signal as well: Amplify or reduce the picking sound of an acoustic guitar, hold the sound of strings longer, or reduce the reverb time of a choir. 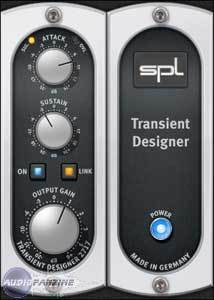 Containing only two primary controls, the UAD SPL Transient Designer is ex- tremely simple to operate. The technology behind the processor isn't as im- portant as how it sounds. Attack enables amplification or attenuation of the attack of a signal by up to ±15 dB. velopes the VCA control voltage is derived. Positive Attack values emphasize attack events; negative values smooth out the attack envelopes of sound events. sustain of a signal by up to ±24 dB. envelope with a longer sustain. From the difference of both envelopes the VCA control voltage is derived. The gradient of the control voltage matches the time flow of the original signal. Positive Sustain values lengthen the sus- tain; negative values shorten the sustain. Gain controls the signal level that is output from the plug-in. The available range is from –20 dB to +6 dB. The default value is 0 dB. Use the Transient Designer on guitars to soften the sound by lowering the AT- TACK. Increase ATTACK for in-the-face sounds, which is very useful and works particularly well for picking guitars. Or blow life and juice into quietly played guitar parts. Distorted guitars usually are very compressed, thus not very dynamic. Simply increase the ATTACK to get a clearer sound with more precision and better in- tonation despite any distortion. Heavy distortion also leads to very long sustain. The sound tends to become mushy; simply reduce SUSTAIN to change that. If you, how- ever, want to cre- ate soaring guitar solos that would make even David Gilmour blush, just crank up the SUSTAIN control to the max and there you go. Does not use too many resources of a UAD-1. It is a plugin that I find interesting, working his way to the dynamics in a different direction than a compressor. can be added free of attacks, reduce the parasitic resonances playing with sustain. Briefly, it gives me a very good plugin powerful enough percussive situations or to model the dynamics of a guitar, or to soften the transients very pronounced on the song. to link with the transient designer in Schaak. despite attacks less candid, he is doing well and also offers a nice alternative native range by offering a different sound. it is my type of mixing tool that can become formidable. itchounet's review (This content has been automatically translated from French)" practice ..."
With the UAD-1 Expert pack the install does a super fast, the site of Universal as well organized This plug works perfectly in Nuendo 3! I have bought your eyes closed because I 'd heard about the hardware version trs nice to give more of lments percussive attack, I thought that this could be a good plug al alternative purchase of the machine. The configuration of the plug is very simple. The plug is running well now for the plug in itself al careful to use yet with finesse, your exact trs can quickly become Drout. I have used a few lments a battery: a snare drum (so so rang bizar I do better with a compressor), and toms (boost the attack of the toms, I think c is in this area vritablement the SPL plug works best)! In short, a plug which is doing its taf, you just have to adhrer a philosophy. In the end I thought my serve a lot of this plug, but n 'is a small plug rien.Bref nice, unfortunately not worth its price at all, too bad ... To me it does more gadget or office spare tire in extreme situations as it introduces vritable!